1ST BDE - More than 600 grenades and 81 eighty-two millimeter mortar rounds were discovered recently by the 25th Infantry Division's 4th Battalion (Mechanized), 23d Infantry. The large cache, which included 20 six-foot bangalore torpedoes, was uncovered in a well-camouflaged, 10 by 14 foot enemy bunker five miles southeast of Tay Ninh. Sweeping through the thick undergrowth, elements of the Tomahawk battalion commanded by Lieutenant Colonel Clifford C Neilson of Mobile, Ala., came upon a sophisticated enemy base camp. Using extreme caution, the men of A Company began checking out bunkers with four feet of overhead cover, not leaving a single stone unturned. 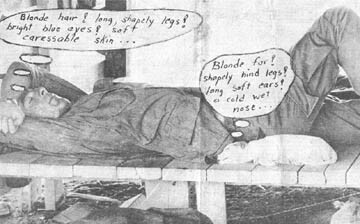 Then SP4 Lawrence A. Davis of Lothian, Md., spotted a well-camouflaged 10 by 14 foot bunker. Very carefully he pulled away the brush concealing the entrance and saw something covered with a poncho inside. 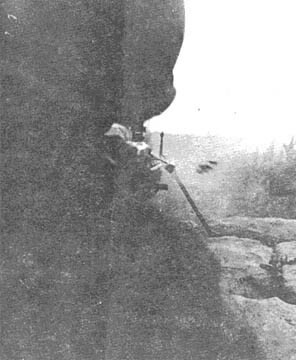 Immediately Davis called for his platoon leader First Lieutenant William McMongle of Colorado Springs, Colo., who placed security around the bunker and thoroughly checked the entrance for booby traps. "I looked as best as I could into the bunker and saw the words 'safety fuze'," stated McMongle, "and knew we had latched onto something good." Private First Class Benton Hoard of Salem Ill., volunteered to enter the dark bunker for a closer look. Armed with a .45 caliber pistol in one hand and a flashlight in the other the Tomahawk tunnel rat entered. The sweat rolled as he probed for booby traps that might be connected to the poncho covering the munitions. Then he shouted: "There's all kinds of good stuff in here." 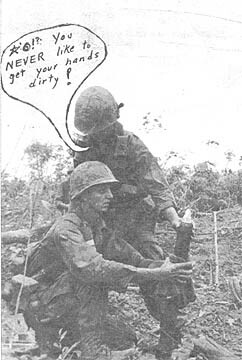 The 1st Brigade infantrymen began hauling out the mortar rounds, claymore mines and hundreds of grenades. After over an hour's work, the munitions were extracted, and a count was made. The Tomahawks counted 617 grenades of various types - "little beer can," "big beer can," "potato masher," and "torpedo" grenades. In addition there were 20 six-foot bangalore torpedoes, 81 82mm high explosive mortar rounds, 31 cans of mortar charges, 12 twelve-inch claymore mines, eight satchel charges and two "black box" antitank mines. The Tropic Lightning infantrymen carried the cache to their night defensive position and laid the munitions in a foxhole just outside the perimeter. There, the cache was blown in place all at once. "When we left it was an ordinary foxhole, but after the explosion," said Captain Henry Montgomery of Memphis, Tenn., the Company A commander, "it looked as if a 1,000 pound bomb was dropped there." 1ST BDE - A hastily sprung night ambush five miles east of Cu Chi by a 25th Infantry Division rifle platoon resulted in greater findings than expected. The ambush was sprung when the 2d Platoon of A Company, 2d Battalion, 14th Infantry, spotted movement to its front. "After our initial burst, we couldn't see or hear anything in front of us the rest of the night," commented Sergeant Louis Gill of Artesia, N.M. The next morning the Tropic Lightning troops swept the area and found a body that had been carried into the brush. Nearby, footprints were found. They led to a wounded Viet Cong hidden in the bushes. "We didn't know whether or not he was armed, so we waited until the interpreter came to talk him out," said Specialist 4 Daniel Carrington, of Beaumont, Texas. When the enemy came out and was interrogated, it was learned that there were still two more of the group left to be accounted for. 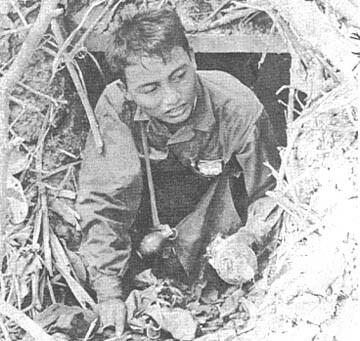 Again the search continued, this time leading to a tunnel entrance where another wounded Viet Cong was hiding. CU CHI - A tax-free reenlistment bonus of $9,540 was recently awarded to Staff Sergeant Larry A. Jones assigned as a rotary wing section chief for the 25th Division Artillery's aviation section. 3D BDE - Military police from the 3d Platoon, 25th Military Police Company drove off an undetermined number of Viet Cong who were attempting to approach the 25th Infantry Division's base camp at Dau Tieng. As the 3d Brigade MPs were closing their check point at the edge of the Michelin Rubber Plantation one evening the often routine task of monitoring the flow of natives in and out of the village of Dau Tieng was broken when they spotted a force of armed Viet Cong slinking toward the community. 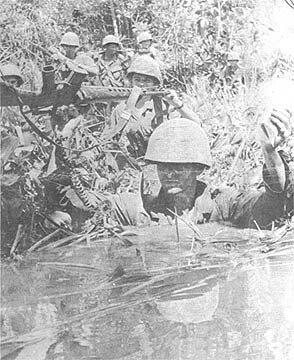 They immediately engaged the enemy with machineguns and small arms as the Viet Cong replied with a fusillade of rifle and rocket grenade fire. The enemy pinned down Specialist 4 Wayne Luke, a machine gunner, who despite the heavy enemy fire changed barrels on the weapon, burning himself in the process, and resumed blasting away at the enemy. A reaction force was dispatched from the base camp as soon as the contact was reported and deployed at the embattled checkpoint. With darkness falling it became necessary to close the checkpoint and withdraw into the Dau Tieng base camp for the night. The new Department of Army policy on early release of enlisted personnel returning to the United States from a short tour area will go into effect August 1. The policy will allow the release of enlisted personnel 150 days prior to completion of their normal term of service rather than the current 90-day release. It had been reported earlier that the change would be effective as of July 1. Have you ever considered where you might go if you had the opportunity to go anywhere in the Free World for 30 days and not have to pay for the transportation? You can have your pick of almost anyplace in the non-Communist World. This would include almost anyplace in Western Europe, North America, Central and South America, Australia, Africa and parts of Southeast Asia. And the Army will pay for your transportation. If you would really like to get away from it all, you might consider the leave recently taken by a couple of adventurous young men within the USARV command. They set off for Pitcairn Island, an isolated, sub-tropical, volcanic island in the eastern Pacific almost midway between New Zealand and Panama. This island was first settled in 1790 by Fletcher Christian and and some of the mutineers from the HMS Bounty, commanded by Captain William Bligh. Most of the 89 residents on the two-square-mile island are descendants of Christian and his men. Before you decide that this is all a dream, read a little further. Under the Army policy on extensions, if you decide to extend your tour in Vietnam for a period of six months or longer, you are eligible for a 30-day leave, which is not charged to your leave time, to almost any place in the Free World. In addition, your leave time does not begin until you arrive at your final leave address. The travel time involved to and from your leave destination is also not charged to your leave time. Here's the way it works. You agree to extend in Vietnam for six months. The Army then grants your 30-day leave and you are on your own to go where you wish. When you return to Vietnam, you then put in your extra six months. The leave time is not included in the six months which you extended for. The latest change in the Army's extension policy is the five-month early out which becomes effective on August 1, 1968. Under this policy, if you extend your tour in Vietnam so that the date of your return to the United States is five months prior to the date of your ETS, the Army will give your separation papers when you arrive in the U.S. So, if you are interested in getting out of the Army five months ahead of your scheduled ETS, and you are wondering how things are on Pitcairn Island, perhaps you should look into the possibilities of an extended tour in Vietnam. For further information, contact your unit's personnel officer. Many questions have arisen concerning the identification of poisonous and non-poisonous snakes in Vietnam. The classical picture of a cobra with its hood spread in the upright position is difficult to miss. However, when the cobra is going about minding its own business, it looks like any harmless snake. Such is the condition with most snakes in Vietnam. If a snake bites a soldier, it is important that proper identification is made. If it is non-poisonous, the man will be spared painful treatment and if poisonous, proper identification will aid in prompt specific treatment. Snakes that bite people should be killed and brought to the hospital with the patient. Care should be made to preserve the head if possible. In the rubber plantations of the III Corps area, the Malayan pit viper is the most common venomous snake. In the area around Saigon and in some areas with brush and cane fields, the bamboo viper is more common. In rice paddies, the cobra is more common. Snakes can be expected to appear with the onset of the rainy season in June and reach a maximum concentration in September and October. During the dry season, they tend to stay hidden in burrows. The venomous snakes in Vietnam fall into two broad families, Elapidae and Viperidae. The Elapidae include two subfamilies; Elapinae (cobras and their allies), and Hydropinae (seasnakes). The Viperidae include two subfamilies; Causinae (primitive vipers), and Crotalinae (pit vipers). Watch out for any type of snake. It is very difficult to distinguish a poisonous and non-poisonous species in the field. The best advice is to leave them all alone. I send you proof of dependency . . . I am in awful bad health and the mother of twenty-two children and I feel like I have done my part in this world and I think I am entitled to some dependency benefits." Some people say that one picture is worth a thousand words. Fine and dandy! But how many times have you wondered what unspoken words are in the minds of the people being photographed. Take the average newspaper photograph. You look at it and the picture itself tells you something. For additional help there's all kinds of information printed below the photo. However, you never really know those secret and sly thoughts of the people in the picture. Well, if you're a visual vampire (a person who loves to "dig his teeth" into the hidden meaning of photos) or a highly frustrated person because you know that the photographer is the only guy who has the opportunity to obtain the juicy, first-hand, inside info on the shot he's taking, don't sweat it. The Tropic Lightning News has come up with a fantastic, never-before, unreal brainstorm. Actually, it's a fairly decent idea. We have perfected a technique by which we can record the split-second brain wave of the person being photographed at the precise moment when the shutter of the camera is open. This process is known as tongue-in-cheek guesswork. The results are shown on these pages. It's a type of overexposed humor, or the "light side" of photographs. 1ST BDE - The 4th Battalion (Mechanized), 23d Infantry will soon lose their own "snowball." 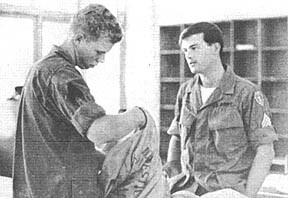 Tanned instead of melted, Sergeant Stephen P. Boelter, from Milwaukee, Wis., is the only man who came with the Tomahawks to Vietnam from Alaska two years ago. And he will be going home for good. With the Tomahawks for three years, Boelter has spent two of them in Vietnam. He first served with the battalion when it was an arctic-trained unit stationed at Fort Richardson, Alaska. He was assigned to Headquarters and Headquarters Company as radio team chief in a relay station monitoring messages on tactical exercises. Then the word came down, "Gentlemen be advised that this unit may be activated for combat in Vietnam." Everyone seriously doubted that this would in fact come about because the Tomahawks were arctic-trained infantry, operating in terrain and climate quite different from that of Vietnam. But in late January 1966, all the men and equipment were loaded on a ship, and they steamed from Alaska, bound eventually for Vietnam. The ship docked in Hawaii and where for the next 84 days the "snowballs" took extensive and vigorous jungle training - learning the game of guerrilla warfare and generally getting used to the hot, humid climate. In late April 1966, the 4th Battalion, 23d Infantry arrived at Vung Tau where they were greeted by General William C. Westmoreland, then commander of American Forces in Vietnam. Boelter can still recall Cu Chi base camp when the Tomahawks first arrived: "It was just an open, dusty field. There was no sophisticated bunker line as we know it today. There was only a series of foxholes around the base camp. Living quarters and a defensive line were our first priority with every man putting in long, hot hours to build bunkers, set up tent kits and form company areas." In May 1966, Boelter was on the first Tomahawk operation in Vietnam - Akron, with the responsible job of being the battalion commander's radio-telephone operator. 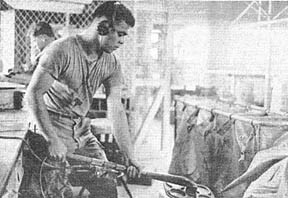 He then participated on Operations Wahiawa, Makiki Kahana II, Oahu, Kipapa and Kalihi. 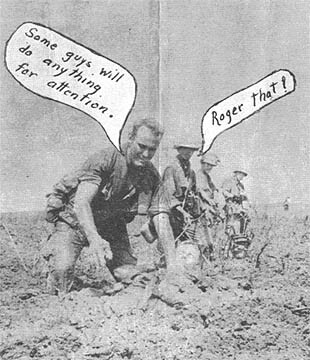 In January 1967, Boelter was with the Tomahawks when they became mechanized on Operation Ala Moana. He served in the battalion operation section. In his new job he participated in Operations Gadsden, Manhattan, Junction City and Makalapa. Late in April 1967, Boelter made a decision and was one of the first "snowballs" to extend for six months. He explains: "I still had time to do in the Army so since I knew these men so well I decided to stay with the Tomahawks." He went home for 30 days and returned for Operations Manhattan, Barking Sands, and Atlanta. Again he extended for six months for the same humble reasons. He returned for Saratoga, Quyet Thang, and Toan Thang I and II. 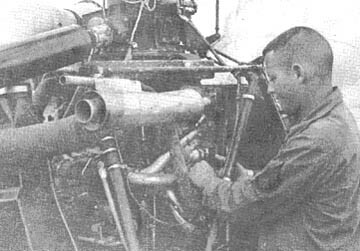 CU CHI - A call from a Catholic priest for maintenance on two .50 caliber machine guns in his church tower led to an interesting day in the fortress village of Cao Xa near Tay Ninh for a 25th Infantry Division small arms repairman. When he got the call, Specialist 4 Phillip E. Perry of Seminole, Okla. couldn't imagine what a priest would be doing with .50 caliber machine guns and asked his section leader at Company B, 725th Maintenance if it was on the up and up. To his surprise, he was told that the priest was authorized the weapons and that he was cleared to go. When he reached the gate at Coa Xa, he was approached by two Vietnamese guards. He asked where he could find Father Du, and the soldiers courteously pointed out the direction. On his way through the town, Perry noticed well-built bunkers with heavily armed guards behind them. Both sides of the road were lined with concertina wire, and the town was surrounded by it. When he reached the village square, his ears were pierced by the voices of children playing in the school yard. Opposite the schoolyard stood a great church with a high tower. On the steps of the church was a man in a white robe, Father Du. Perry introduced himself, but the communication between the two men was a little difficult, so Father Du called an interpreter. When the interpreter came, Perry followed them up the 142-foot tower, where the machine guns were mounted. While he worked on the weapons, Perry asked the interpreter about the priest who remained such a mystery to him. Because of the Communist take over in North Vietnam, the Catholics were forced to move out. Father Du migrated to South Vietnam in 1954. Moving only at night, he brought 400 families of his parish to the South Vietnam coast, where they were picked up by the United States Navy and taken to Saigon. In Saigon, the Vietnamese government granted them 400 acres in the province of Tay Ninh, and Father Du started building his dream again. First the homes, then a church and finally a school for the 800 children. But before his dream was fulfilled, new trouble erupted. 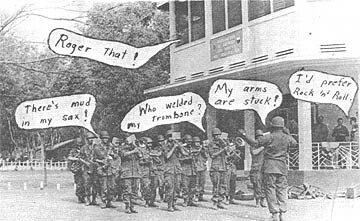 The Viet Cong started levying taxes and drafting men into their army. Because of the instability of the South Vietnamese Government at that time, Father Du was left to solve the problem alone. When the Viet Cong started demanding higher taxes, he and his people refused to pay. The Viet Cong reciprocated with terrorism and murder. Father Du reorganized the small army he had when they were in North Vietnam, and started training new recruits. When he thought they were strong enough to fight, he attacked the enemy. The VC were taken by surprise and forced to retreat. Thus, the defense of the town began. Overnight, bunkers started springing up, and barbed wire formed a perimeter. With the weapons they captured from the enemy and the weapons offered to them by the U.S. Army, Coa Xa became strong enough to hold back the Viet Cong. The villagers of Cao Xa proved their determination and prowess a number of times. The Viet Cong staged numerous attacks on the small fortress, but all were turned back. During the Tet offensive, the Viet Cong - confident of a victory - staged their biggest attack on the village. The battle lasted for hours; but finally the VC withdrew, leaving 45 dead. Today Cao Xa is a prosperous village, loyal to the South Vietnamese government. The children attend schools and are taught English. Father Du has his church and a dream fulfilled. What's Going On At The APO? CU CHI - Ever wonder how our mail system works? APO 96225 provides the necessary service. To do its job the Cu Chi Post Office is divided into three sections: finance, locator, receiving and shipping. The finance section handles money orders, stamps and the mailing of packages. The section also uses a mine detector to check packages for firearms or ammunition. The locator section has a file of about 40,000 cards with addresses of Division personnel, including those who have been re-assigned in the last year. The office re-directs about 900 letters a day. Of course, the most important function of the post office is the delivery and pick up of mail. APO personnel pick up incoming mail at Tan Son Nhut Airport around 8:00 a.m. daily. This mail has come from postal centers in San Francisco or Seattle and anywhere from 7,000 to 12,000 pounds arrives daily for Cu Chi. The mail then goes by convoy and arrives at Cu Chi about noon. 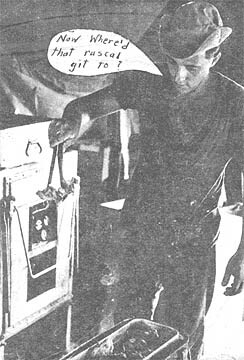 Heavier fourth class mail comes by ship and postal clerks check at the docks weekly for Cu Chi-bound packages. 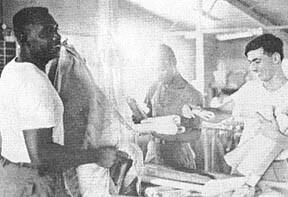 Soldiers in the Saigon area hospitals have their mail delivered daily from the Cu Chi Post Office. Before outgoing mail is shipped it is broken down into various states. If a letter happens to become unsealed before reaching the APO, postal clerks re-seal it. 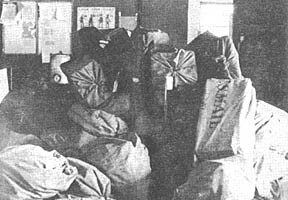 Around 2:30 p.m. daily outgoing mail of usually 1,000 pounds or more is taken by convoy to the Air Mail Terminal at Tan Son Nhut for its flight to the west coast and from there to the homes of friends and relatives. 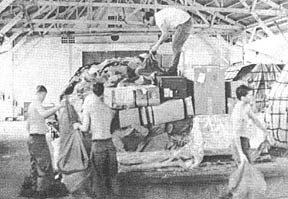 PICK UP POINT - Postal clerks at Tan Son Nhut Airport sort out Cu Chi-bound mail. PAPER ROUTE - Postal clerks SP4 Joe Lyons of St. Louis, Mo. and SP4 Kieth Collins of New York, N.Y. handle the ever-popular hometown newspapers with PFC Joe Rivera. STATESIDE BOUND - Specialists Rivera and Collins assist Sergeant Lou Kliner of Plainsville, N.J in separating outgoing mail. INCOMING - Three to six tons of mail arrives at Cu Chi's post office daily. HOSPITAL RUN - Sgt. Mark Beamer of Los Angeles, and Sgt. 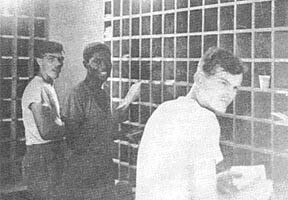 Jim Bingham of Cincinnati, Ohio sort mail at the 3d Field Hospital near Saigon. TICK TICK - SP4 Antonio Gaoiran of Merced, Calif. uses a mine detector to help prevent unlawful mailing of firearms and ammunition. The Army pays a special Variable Reenlistment Bonus (VRB) of up to $8,000 to men with valuable experience in critically needed MOS's. When added to the normal reenlistment bonus, the VRB often provides a large nest egg of savings and security. To be eligible for a bonus, personnel must have at least 21 months of active service on their present enlistment, have never received a reenlistment bonus, be at least an E3, and be classified in an MOS designated for the VRB at the time of reenlistment. Many men are eligible for a VRB with a multiplier as high as four. When awarded in Vietnam, the bonus is tax-free. Jones of Dublin, Ga., entered the Army in July, 1966, as a draftee. Within just 23 months he was promoted to the rank of staff sergeant. Jones also has a good chance of setting a record among DIVARTY personnel for length of tour in Vietnam. He arrived in country in December, 1966, and his present extension takes him to October 16th of this year. He plans to extend again in October. After administering the oath of reenlistment, Colonel Gordon Sumner, Jr., Division Artillery commander, personally thanked Jones for his contributions to the aviation section and for his individual efforts in making the Army a team. Wonder what's happening around the Division? men and units of the 25th Infantry Division. Lightning Two-Five takes you where the action is. 3D BDE - "Everybody pop smoke" was the enthusiastic cry as companies of the 3d Battalion, 22d Infantry pulled into Dau Tieng base camp after a record 88 days in the field. The smoke-popping ritual marked the start of a stand down and a well earned rest. Operation Toan Thang II so far proved to be most successful for infantrymen of the 3d of the 22d. From April 10 through July 6 the 3d Brigade, 25th Infantry Division Regulars killed more than 275 of the enemy. While combing woods and jungles, wading through rice paddies and slogging through swamps, men of the 3/22 came up with more than 75 AK-47 and AK-50 assault rifles, more than a dozen RPG-2 rocket launchers, upwards of 100 grenades and 7,000 plus rounds of small arms ammunition. In addition, they found close to 100 RPG rocket rounds, 80 RPG boosters, and more than a dozen light machine guns. To this were added more than 10,000 pounds of contraband rice - in all it was a truly impressive list. The days at Dau Tieng were rewarding ones for the Regulars. Brigadier General Carleton Preer Jr., assistant division commander for support, was on hand to present 11 Silver Stars. Lieutenant Colonel Roy K. Flint, battalion commander, presented 42 Bronze Stars and 141 Army Commendation Medals to men of his command. During the remainder of the time in camp the battalion made sure that its weapons and equipment were in good condition. Then the men began to unwind a bit. Company sponsored barbecues were on the agenda with steaks, hamburgers, refreshments for all. Trips to the gift shops, swimming pool and PX were also in order. 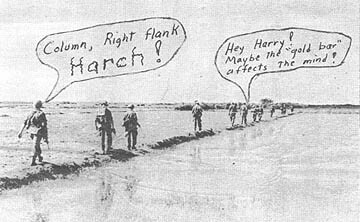 For some it was a time to answer letters that just couldn't be answered while in the field - for others, a time to just relax and get caught up on some sleep. 2D BDE - Mess halls of the 2d Brigade are competing for "Best Mess" awards on both the brigade and battalion levels. According to the brigade's food advisor, Chief Warrant Officer June T. O'Rock, of St. Cloud, Fla., the competition will "enhance the program and give the cooks and mess stewards more incentive." The winner of the best mess award for June was 2d Brigade, Headquarters and Headquarters Company mess hall, Staff Sergeant Randon, mess steward. The winner of the best mess award is decided by O'Rock who conducts surprise inspections rating the mess halls on a point basis. The mess hall with the greatest number of points wins the title "Best Mess" and receives a plaque. "The plaque is hung on the wall of the unit mess hall for thirty days," O'Rock continued, "with this plaque up there they can't afford to be bad." O'Rock explained that it is possible to be both the best mess of a battalion and best mess of the brigade. The criteria for the inspections includes sanitation, storage, and preparation, personal hygiene, maintenance of equipment, and overall appearance. After the inspections, the deficiencies are kept on record and corrective actions are noted. Winners of their respective battalion awards were: 1st Battalion, 27th Infantry, Headquarters and Headquarters Company mess hall, Staff Sergeant Anderson, mess steward; 2d Battalion, 27th Infantry, Headquarters and Headquarters Company mess hall, Staff Sergeant Waller, mess steward: 1st Battalion (Mechanized), 5th Infantry, Headquarters and Headquarters Company mess hall, Staff Sergeant Gallard, mess steward.